With an old-fashioned Southern charm, Atlanta is a living example of how a railroad can turn the fortune of a simple town. Proudly conscious of its ties with Confederacy, the city was in a league of her own. When the Union Army crossed into Atlanta, the city fell, burned to rubble, and rose from the ashes of the American Civil War and covered its scars and went with the wind. A great influx of new citizens with high hopes poured into city's antebellum society and by 1868 it was humming like a beehive again. Once the Coca-Cola was invented here, it thrived on its economic upswing and became a vanguard of the New South. Balancing southern traditions with sleek modernism, the sprawling capital of Georgia is renowned for being the backyard of Martin Luther King Jr. and Margaret Mitchell. From Gone with the Wind to Driving Miss Daisy and The Walking Dead, it has come a long way to be what it is now, &qout;the city too busy to hate." The city lies in the fore-land of southern foothills of the Appalachian Mountains in north Georgia State in the United States. By Air − Hartsfield−Jackson Atlanta International Airport (ATL), seven miles south of downtown, is a primary intercontinental gateway to the city. The domestic terminal is accessed from Interstate 85 (exit 72) and international terminal is near Interstate 75 (exit 239). By Train − Peachtree Station is served by Amtrak's Crescent train that runs between New York City and New Orleans. The MARTA provides public transportation via buses and heavy rail. The 2.7-mile-long Atlanta Streetcar line traverses several tourist attractions in downtown. 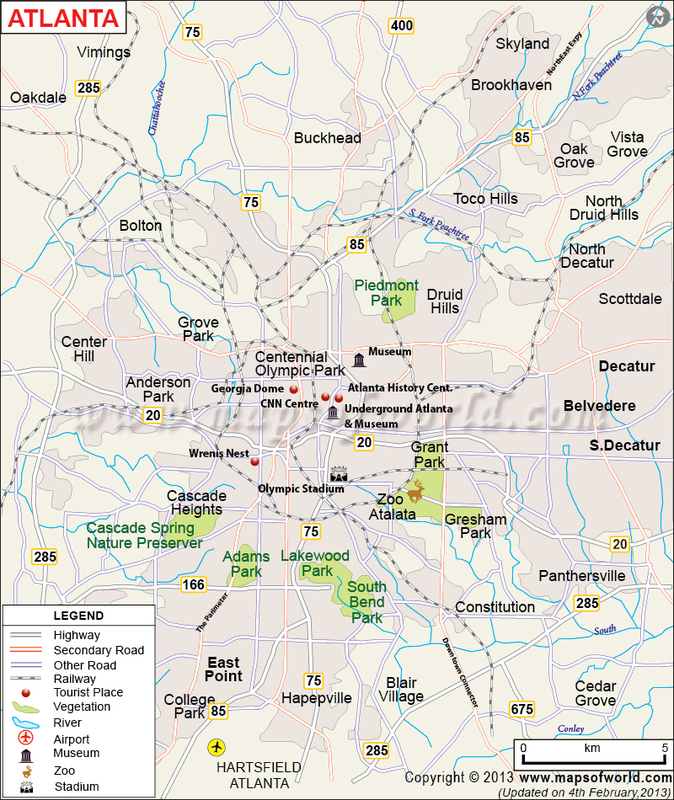 By Road − I-20 (east-west), I-75 (northwest-southeast), and I-85 (northeast-southwest) are major highways in the city. Bus Bank takes visitors to a number of attractions and organizes city tours. Fall, winter, and early winter is the best time to visit. Weather is a bit sticky in late spring and summer months. However, key festivals and outdoor activities happen between May and August. Martin Luther King, Jr. National Historic Site −Now a beacon for justice and equality, this is where the modern crusader Dr. King was born, raised, and buried. The 35-acre complex encompasses several buildings such as his boyhood home, Ebenezer Baptist Church, and his final resting place which reads "Free at last!" The visitor center and museum chronicle the American Civil Rights Movement and the life of Martin Luther King Jr. Museums − World of Coca-Cola entertainingly chronicles the history of The Coca-Cola Company and its path-breaking advertising. Guests can also visit the interactive exhibit of 'Vault of the Secret Formula', 'Taste It! ', and 'Bottle Works.' High Museum of Art is famous for its diverse art collection and modern architecture. Over 14,000 artworks of American and European artists from 19th and 20th century are on display here. Children's Museum of Atlanta is a hands-on museum featuring an indoor playground and 20-minute musicals. Six Flags Over Georgia −From high-speed coasters to fun rides for the kids, this 290-acre theme park is a popular destination for family entertainment. Goliath, Mind Bender, Acrophobia, Gold Town Racers, Monster Mansion, and Riverview Carousel are among the best rides to try. The 40-acre Six Flags White Water features water slides, fantasy tree house, wave pool, and lazy river. Georgia Aquarium − This larger-than-life aquarium is, in fact, the biggest in Western Hemisphere with 10 million gallons of water and tens of thousands of animals. Ocean Voyager exhibit allows visitors to walk through an acrylic tunnel under whale sharks and manta rays. For a more thrilling experience, dive or snorkel in a tank with sharks. Zoo Atlanta −While it accommodates over 1,300 animals from nearly 220 species, its most prized possession is giant pandas. Miniature train ride, a carousel, and rock climbing wall are also on offer with additional fee. Margaret Mitchell House − If Atlanta could speak, it'd have the narrative of prolific author Margaret Mitchell. Her Pulitzer Prize-winning novel, Gone with the Wind, was written in this historical house museum. A section of its museum is devoted to the making of the 1939 movie starring Vivien Leigh and Clark Gable. Atlanta Botanical Garden −Located adjacent to Piedmont Park, it is a lovely space of manicured gardens laid out in 30 acres. The Fuqua Orchid Center has a variety of unique orchids native to South America and the Fuqua Conservatory is home to tropical and desert flora. The garden is at its floral glory around spring, however, indoor gardens are always pleasant to take a stroll. Georgia State Capitol, Atlanta History Center, Jimmy Carter Library and Museum, Swan House, Center for Puppetry Arts, Woodruff Arts Center, and Oakland Cemetery are notable places to visit in the city. Take a guided behind-the-scenes tours of CNN studios, cheer for the Atlanta Braves and the Falcons, admire the sculptures and mural in Woodruff Park, attend a live concert in Chastain Park Amphitheatre, re-enact Hollywood scenes in ATLwood, and plan a day trip to Stone Mountain Park; there is so much around here to keep travelers occupied. 1. Parks and Recreation − Atlanta carries the reputation of "city in a forest" due to a lush canopy with magnolias, dogwoods, and magnificent oaks. Piedmont Park is the most iconic green space and a focal point of outdoor activities in Atlanta's Midtown neighborhood. Picnic spots and facilities for tennis and soccer are available in this dog-friendly park. In Centennial Olympic Park, visitors can splash in the Fountain of Rings or go ice-skating even on a hot summer day. Remember to stop by Grant Park for the Atlanta Cyclorama & Civil War Museum and for a tour of Kendeda Canopy Walk. The Chattahoochee River caters to water-sport enthusiasts with opportunities for tubing, kayaking, canoeing, and fishing. Explore miles of Atlanta BeltLine on foot or two-wheelers, stop and smell the orchids in an urban oasis of Piedmont Park, and learn aviation history at Delta Flight Museum. 2. Shopping − Underground Atlanta is a shopping and entertainment district center with high-end stores. Famous for the alternative culture, Little Five Points neighborhood has bohemian shops, bookstores, and coffee shops. For something edgier, Atlantans head for the boutiques of Virginia Highland and antique stalls along Bennett Street. For collecting souvenirs, Scott Antique Market and Chamblee Antique Row are the usual picks. 3. Theater, Dining, and Nightlife − Musicals and classical dramas light up city's theater scene before they rise to fame in the Big Apple. Fox Theatre Historic District is a popular venue to catch cultural events including the Atlanta Ballet and Broadway acts. Eclectic restaurants in the Little Five Points and watering holes abound in Kenny's Alley. While The Varsity is a good choice for traditional Southern fare, in Mary Mac's Tea Room, Paschal's, and Horseradish Grill, southern cuisine meets a global palate. From the casual atmosphere in Virginia-Highland to trendy vibe in Midtown, city's nightlife suits every style of letting loose. Besides blues joint and hip-hop scene, Atlanta is considered the mecca of strip clubs in the US. Get a lap dance or make it rain in Magic City, ONYX, and The Cheetah Lounge. 4. Festivals − Some of the most awaited events in the city are: Atlanta Dogwood Festival, AJC Peachtree Road Race, National Black Arts Festival, Atlanta Film Festival, Georgia Renaissance Festival, Atlanta Jazz Festival, and Dragon Con Independent Film Festival.